Even today, rituals form a part of the lives of many of us whether we are a professional footballer who always puts on their left boot first, or simply ‘needing’ a cup of coffee to start the day. These rituals give a small sense of control over aspects of life that may seem random. The world of science also tries to understand the world around us and formulate laws to explain what is going on. Whether it is the movement of the planets around us; or why iron is different from copper; or why hydrogen and oxygen combine to create water (and why passing electricity through water can generate hydrogen and oxygen); or how does a laser work? From the moment that the apple allegedly fell on Isaac Newton’s head up to the device on which you are reading this text, science has strived to understand and explain the world around us. The world as we normally experience it is full of things we can see and feel. Scientists have developed ways to see things we can’t imagine – whether it is galaxies across the universe or particles that are smaller than atoms, both of which need expensive equipment and new ways of thinking to understand them. In the case of very small particles, scientists refer to this branch of science as quantum mechanics. It is an area of science that is difficult to approach because the laws that operate in this area of physics seem completely different from those in normal life. One feature is that uncertainty is an unavoidable aspect – no ritual can be used to bring control into this area of physics. Two scientists have their names associated with this uncertainty: one is Werner Heisenberg whose name is now tied to The Heisenberg Uncertainty Principle. The other is Erwin Schrödinger who attempted to explain one area of this branch of science with a thought experiment to explain how an event has some uncertainty until it is observed. His famous thought experiment locks a live cat in a box together with a device that operates completely randomly and might release a poisonous gas at any moment in time. If the device emits the gas, the cat will be killed, but from outside the box, the Observer cannot tell if the cat is alive or dead. The Observer can only discover the state of the cat (alive or dead) by opening the box. Schrödinger was making the point that from outside the box, the uncertainty about the state of the cat means that the Observer could imagine the cat is in both states (alive and dead) until the box is opened. This paradox has been immortalised and is widely known as Schrödinger’s Cat. 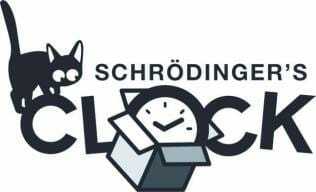 Schrödinger’s Clock® uses the familiar concept of a clock, as a time-keeper, to illustrate the principle that Schrödinger described but doing so using every-day items like clocks and the Apple Watch. This web site tells you all about the Clock, and also gives some references if you want to dig deeper into the intriguing world of quantum mechanics.